Here are some sample values that you might have thought was true (at least I did), but it actually evaluates to true. Remember if it's not on the false list, it's true! Since every value in JS evaluates to a boolean (true or false). We can shorten our conditional in the if statement. Similarly, you can use it to shorten your condition in the ternary operators. Here's an interesting one. You can use || and && to return a value. 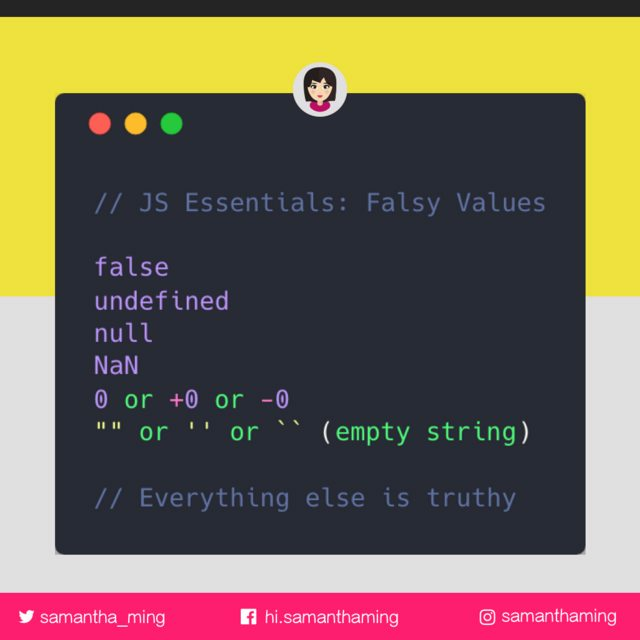 Definitely knowing what value is falsy and truthy is super important. const or = "" || "hi"; // "hi"
const and = "" && "hi"; // ""
const and =  && "hi"; // "hi"